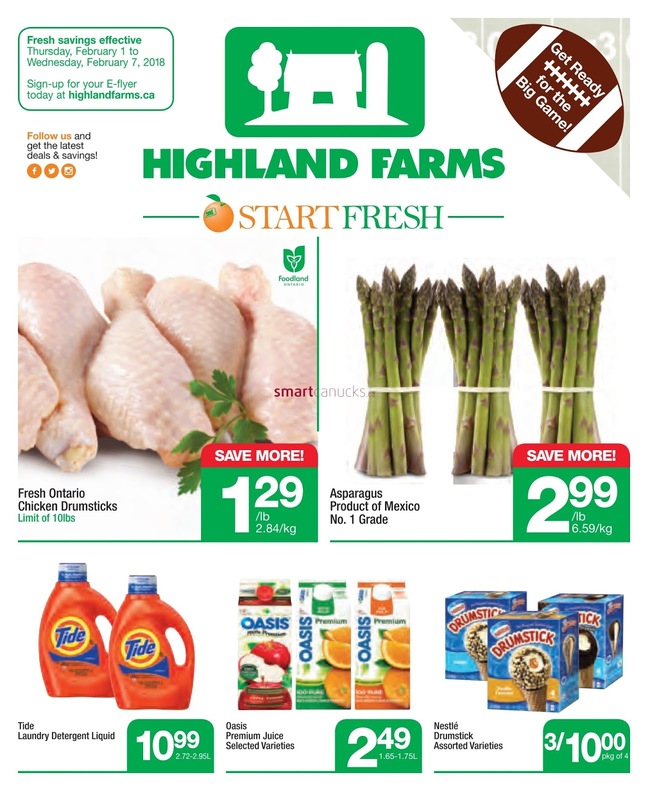 Highland Farms Canada Flyer February 1 - 7, 2018 - Fresh Ontario Chicken Drumsticks $1.29/lb Sale Price $2.84/kg. Limit of 10 lbs. Foodland Ontario. Asparagus $2.99/lb Sale Price $6.59/kg. Product of Mexico. No.1 grade. Oasis Premium Juice $2.49 Sale Price Selected varieties. 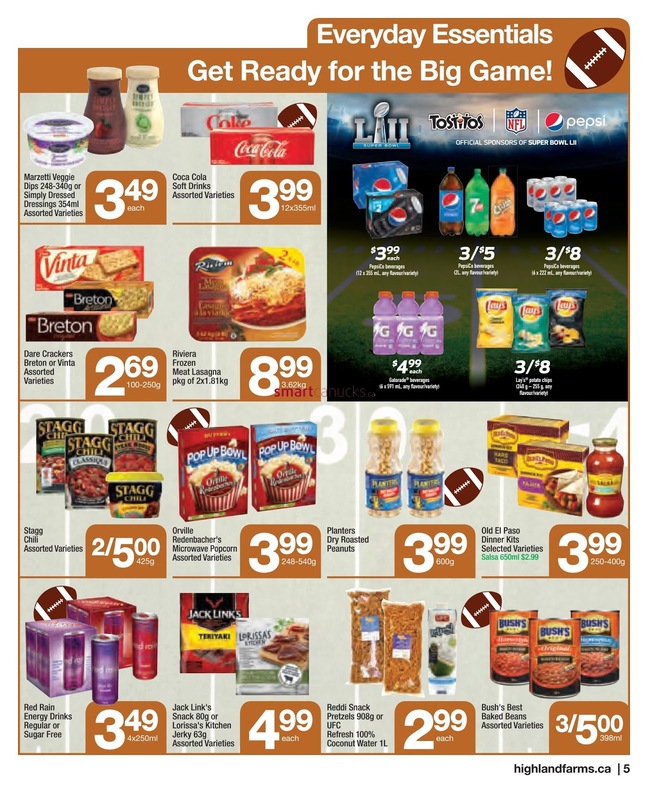 1.65 - 1.75 L.
Nestle Drumstick 3/$10.99 Sale Price Assorted varieties. Pkg of 4. 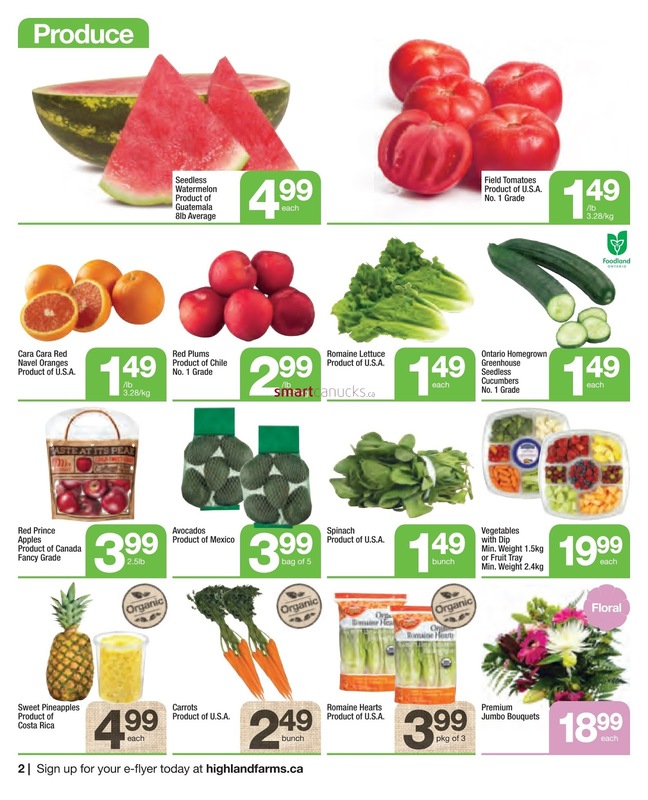 Seedless Watermelon $4.99 Sale Price Product of Guatemala. 8 lb average. Romaine Hearts $3.99 Sale Price Product of U.S.A. Pkg. of 3. Organic. 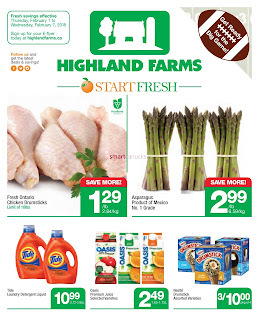 Highland Farms Canada Flyer Vegetables With Dip Or Fruit Tray $19.99 Sale Price Vegetables with dip min. weight 1.5 kg. Fruit tray min. weight 2.4 kg. Red Prince Apples $3.99 Sale Price Product of Canada. Fancy grade. 25 lb. Avocado $3.99 Sale Price Product of Mexico. Bag of 5. 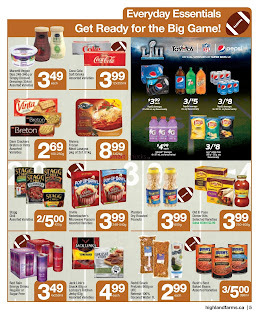 Dempster's Sliced Bread Whole Grains Or Deluxe Sausage Or Hamburger Buns 2/$5.00 Sale Price Dempster's sliced bread whole grains 600 g. Selected varieties. Deluxe sausage or hamburger buns 6 - 8 pkg. Highland Farms Country Kitchen Fresh Mini Twisted Danish $2.99 Sale Price Assorted varieties. Store-baked. Pkg. of 8. Yoplait Yogurt Source Or Source Greek Or Western Dry Cottage Cheese $4.99 Sale Price Yoplait yogurt source 16 x 100 g. Source Greek 8 x 100 g. Assorted varieties. 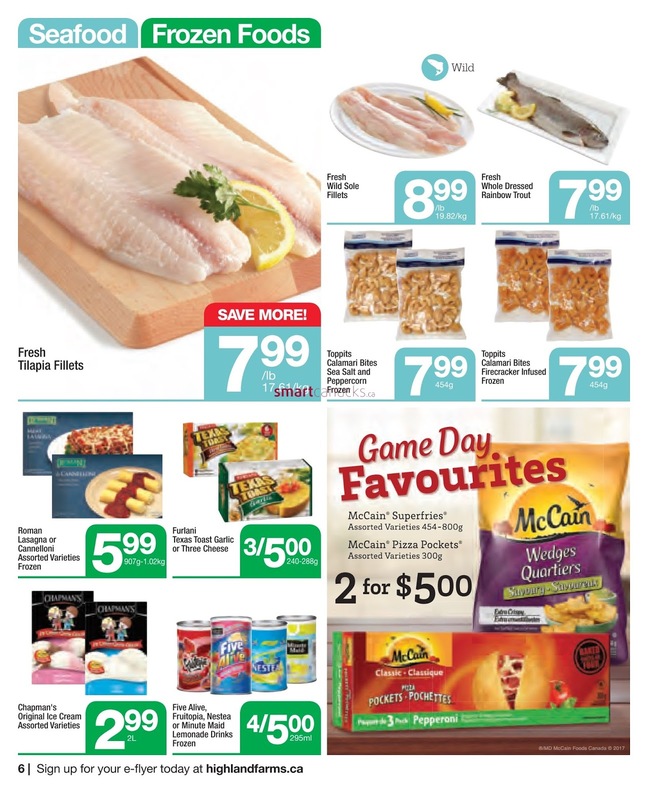 Highland Farms Flyer Western dry cottage cheese 500 g. Saputo Shredded Cheese Or Heluva Good French Onion Dip $4.99 Sale Price Saputo shredded cheese 320 g. Assorted varieties. Heluva good french onion dip 680 g. Pillsbury Crescent Rolls Regular Or Reduced Fat & Wiener Wraps $1.49 Sale Price 200-235 g. Agropur 2 Organic And 1 Organic Butter $5.99 Savings Buy agropur 2 organic 2 L and receive 1 organic butter 250 g free. Royale Bathroom Tissue Mega Or Ultra Or Velour, Facial Tissue Or Tiger Regular Towels $6.97 Sale Price Royale bathroom tissue mega 9. Ultra or velour 12. Double 12. Facial tissue or Tiger regular towels pkg of 6. General Mills Fibre Or Oatmeal Crisp $3.99 Sale Price General mills fibre 1 425 - 450 g. Oatmeal crisp 425 - 505 g. Selected varieties.